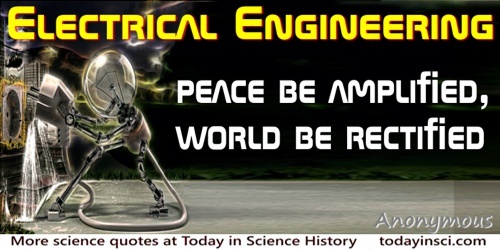 Electrical Engineering: Peace be amplified, world be rectified. Sciences distinguished have a dependence upon universal knowledge, to be augmented, and rectified by the superior light thereof; as well as the parts and members of a science have upon the maxims of the same science, and the mutual light and consent which one part receiveth of another. From 'Interpretatio Naturæ' ('Of The Interpretation of Nature'), collected in The Works Of Francis Bacon (1803), Vol. 2, 140.